Yesterday I made a quick half day trip up to Mt. Evans to do some shooting. As always there was plenty to keep my trigger finger busy. The numerous wildfires that are burning in Colorado right now made for some less than ideal skies, but it was still a great day. This is the view of Mt. Evans from Echo lake. 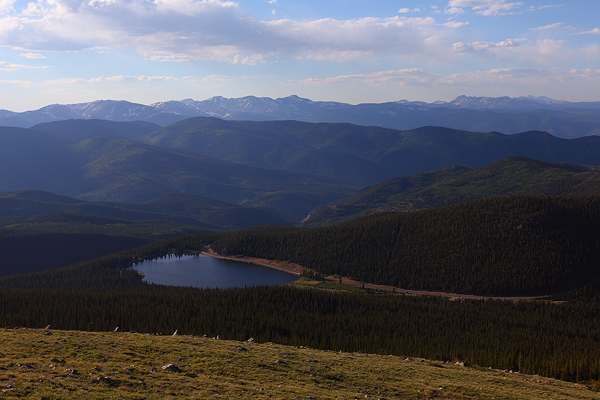 Situated at around 10,500 ft above sea level, Echo Lake gives you a great view of, my final destination. The first major point of interest on the road up the mountin is the Mt. Goliath Natural Area. This is where you will fine Mt. 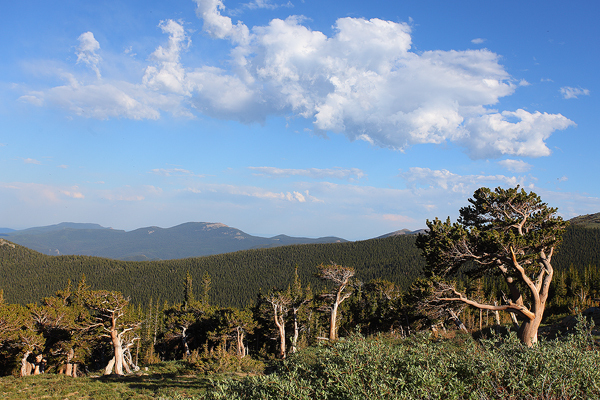 Evan's bristlecone pines. 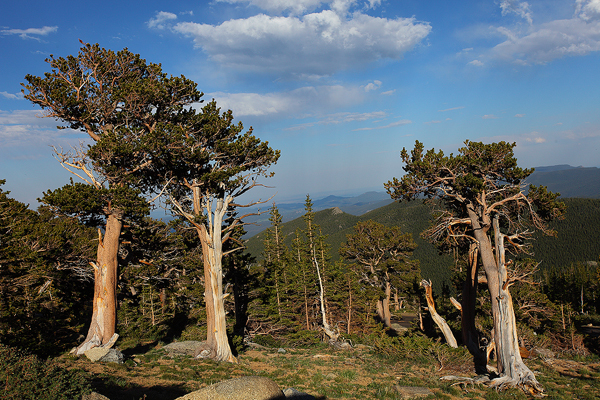 These hardy trees, which are some of the oldest living things on the planet serve as a boundary between the sub alpine forest and the alpine tundra. Although other bristlecones in the country are much older than the trees seen here ( some bristlecones are as old as 5,000 years) The Mt. Evans trees are around 1,600 years old. Pretty amazing to think about what the world must have been like when these trees first started growing. The twisted ancient trees look out over the Colorado plains to the east. Mt. Evans Bristlecone pine forest. 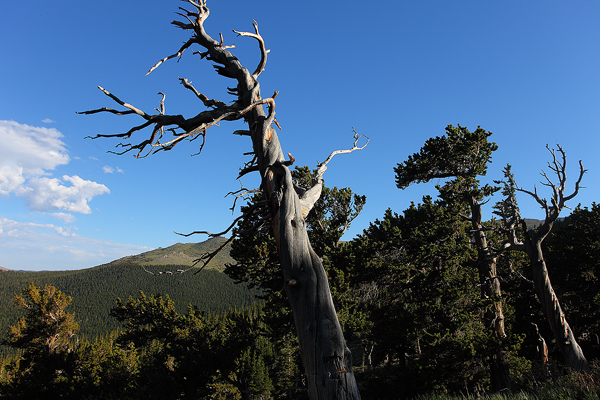 This is my favorite of the bristlecone trees. 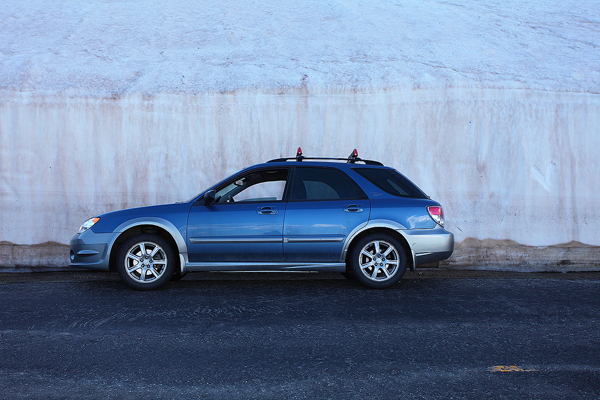 For many years I've stopped to photograph it. 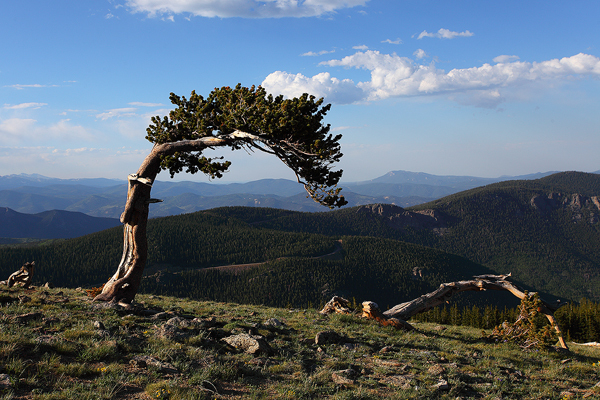 Although it doesn't appear to be the oldest tree on the mountain, I feel it has the most character. 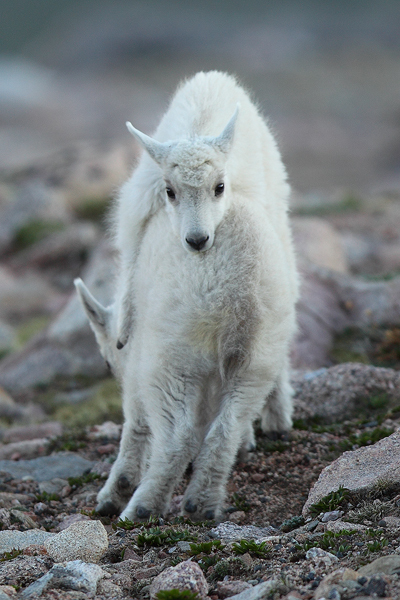 Almost July but there is still a decent amount of snow in places. 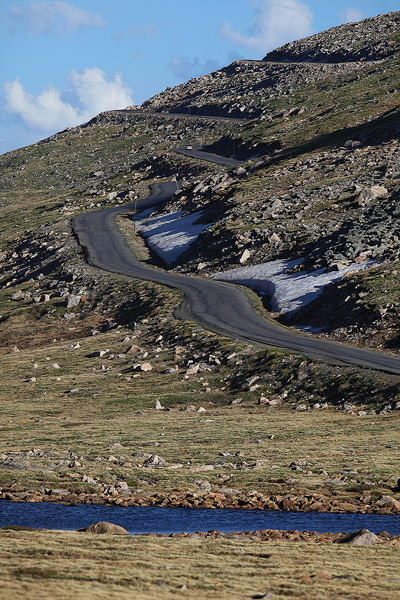 The road starts to switchback on its way to the summit. 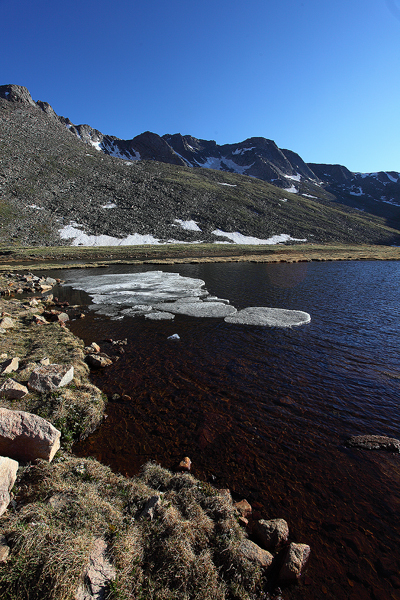 Sitting at 12,830 ft, Summit Lake is still partially frozen. 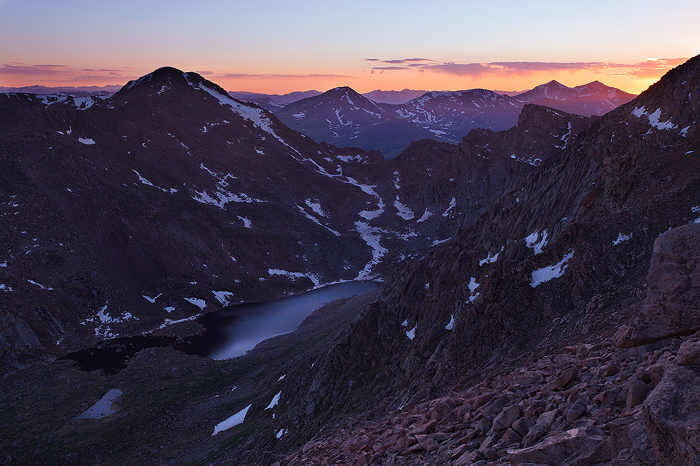 The lake sits in a cirque formed by the peaks of Mt. Evans and Mt. Spalding. 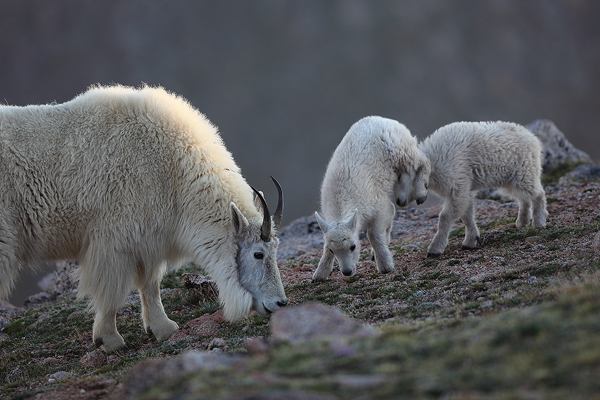 The rocky cliffs rise up to the summits of both mountains. 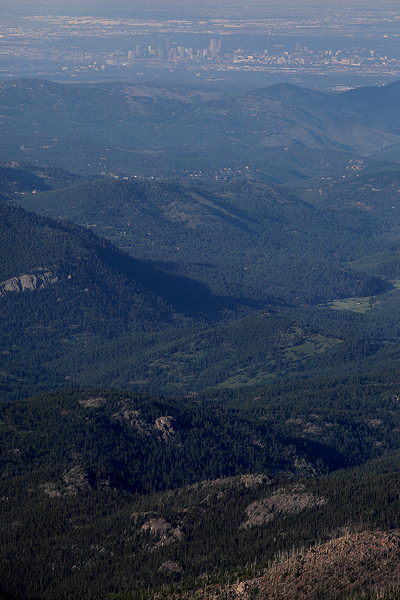 A birds eye view of Denver. Unfortunately, Denver is a pretty smoggy city, but with the wildfire smoke hanging in the air, visibility was really bad. 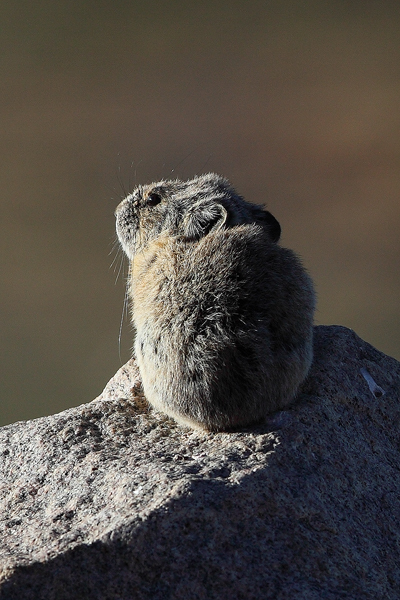 One of my favorite animals to photograph, the American Pika, sits atop a rock in the warm sun. 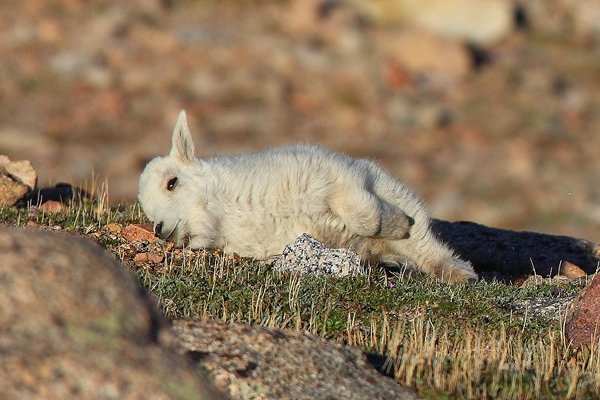 Pikas have been hit hard by global warming. 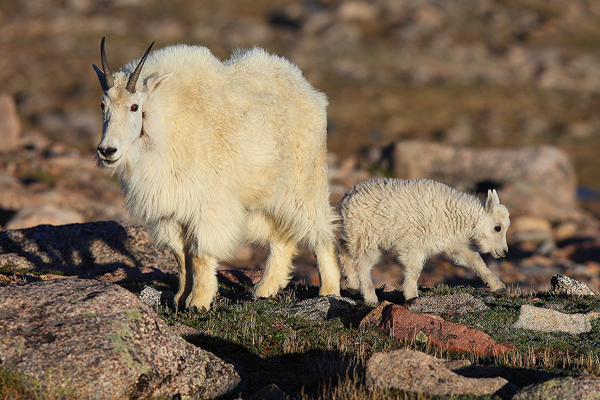 They are very sensitive to changes in temperature and cannot survive in temperatures as high as 80 degrees. 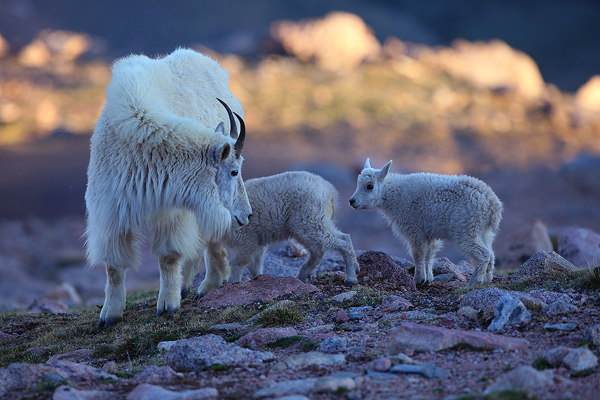 As a result their populations are quickly dwindling. 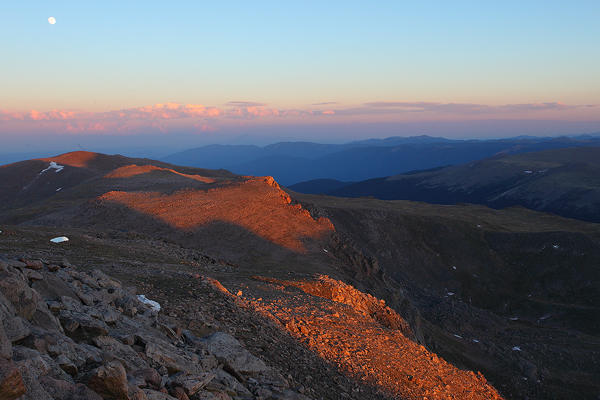 A beautiful night to be on a mountain. 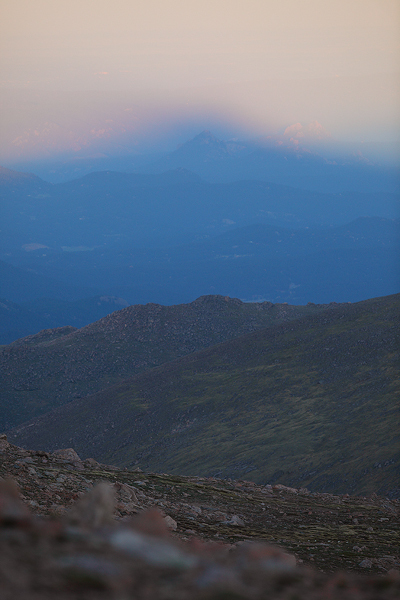 Longs Peak, Rocky Mountain National Parks most famous fourteener, is seen rising in the distance. 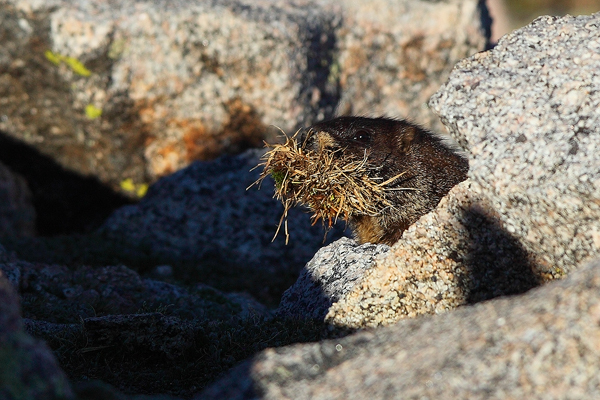 A yellow bellied marmot rushes back to his burrow with a mouth full of grass. I finally found what I was looking for. 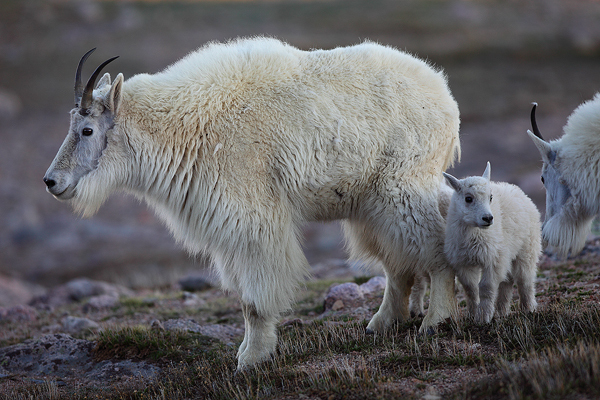 A mountain goat nanny with a tiny little kid. 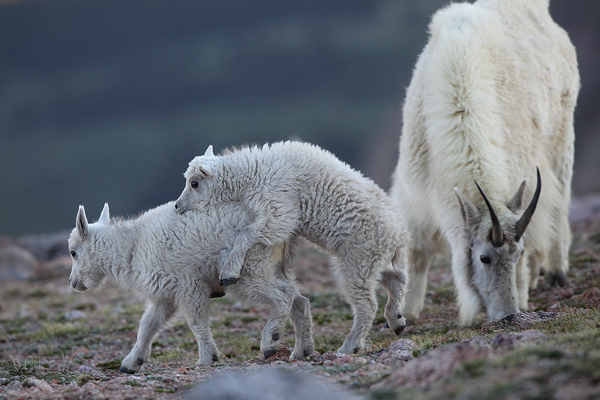 The little mountain goat kids are so much fun to watch. So full of energy and curiosity. 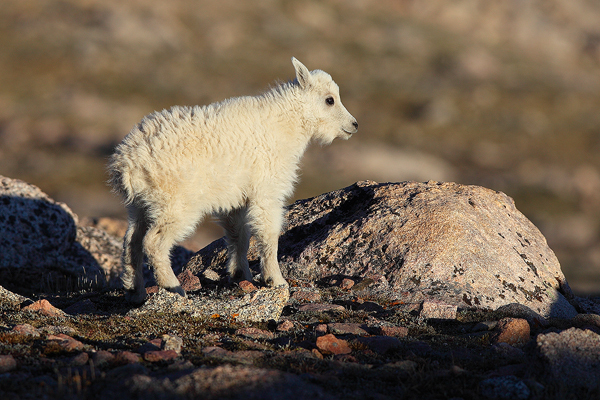 The baby mountain goat surveys his high altitude surroundings. 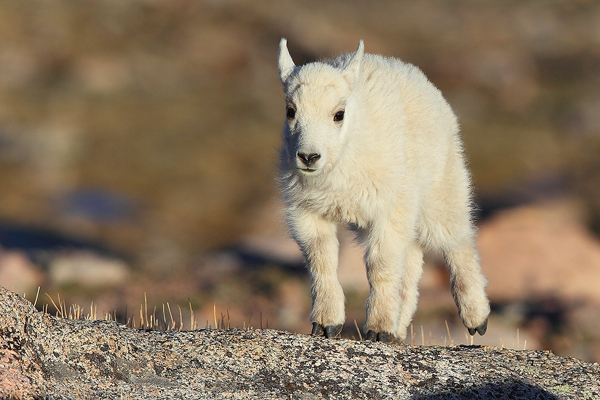 Even a baby mountain goat needs his rest. 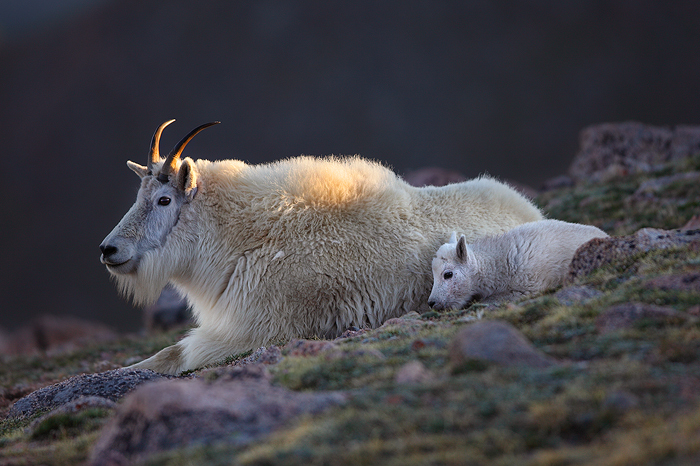 A nanny mountain goat and her kid bed down for the evening as the last rays of the day slip behind the mountain. 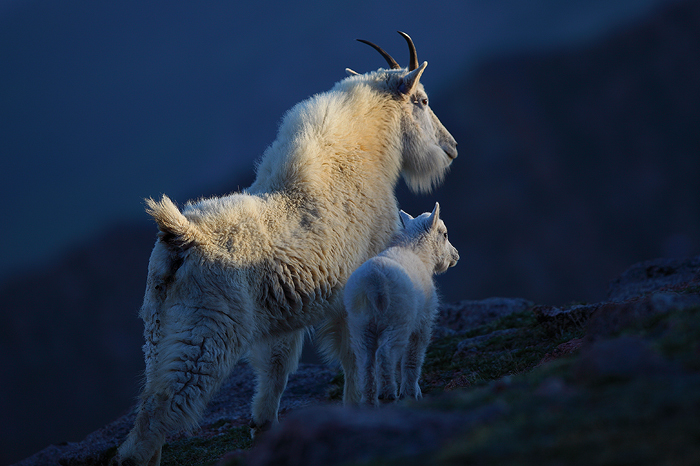 A nanny mountain goat and her kid look of towards the sunset. 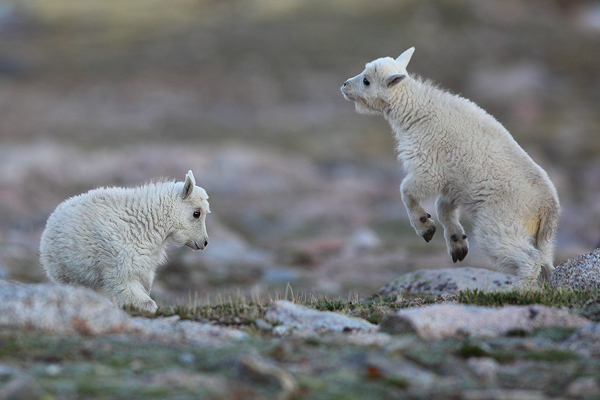 It was great fun to watch these two play around. Two nannies and a kid. 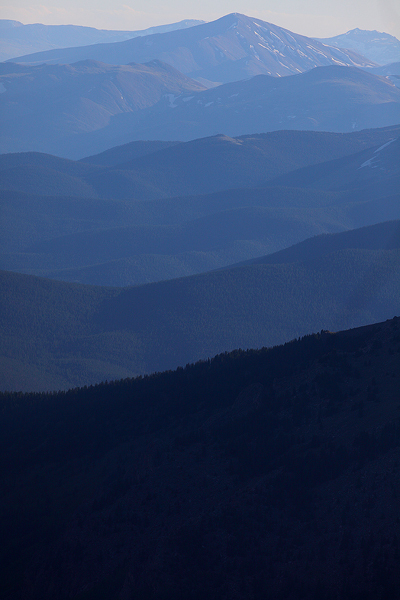 Light starts to fade over the rockies. 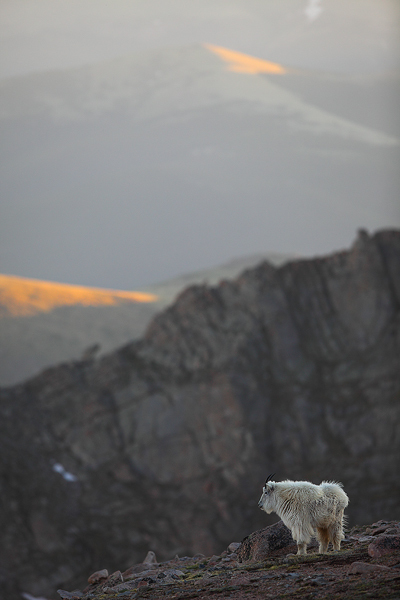 A lone goat stands on the tundra at last light. A very beautiful night indeed. 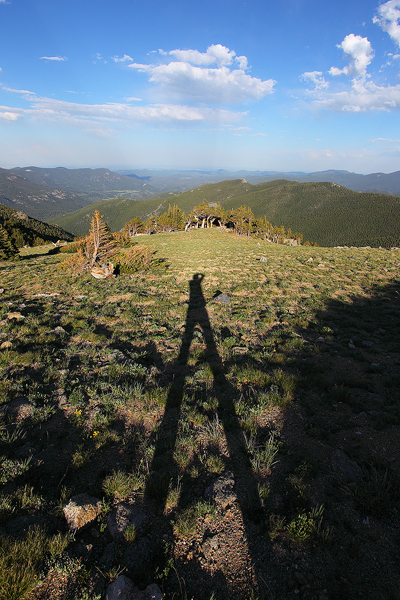 The shadow of Mt. Evans is cast across the eastern plains. Mt. 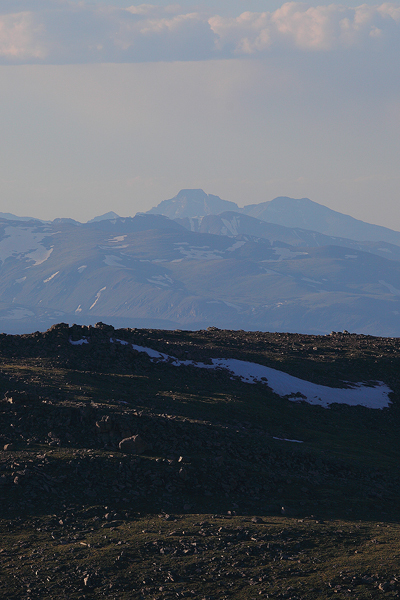 Bierstadt (14,060 ft.) Looms large over Lake Abyss, as seen from near the summit of Mt. 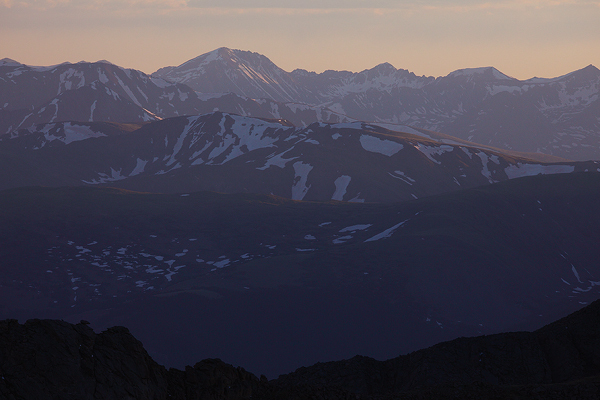 Evans (14,264 ft.) Two more prominent "fourteeners", Greys Peak (14,270 ft.) and Torreys Peak (14,267 ft.) are seen in the distance, still bathed in the warm glow of sunset. Back to my favorite tree for a little night photography. Last shot of the day... The moon shines through the limbs.